Out in front of my house in my jammies on Saturday morning, I was in tears. 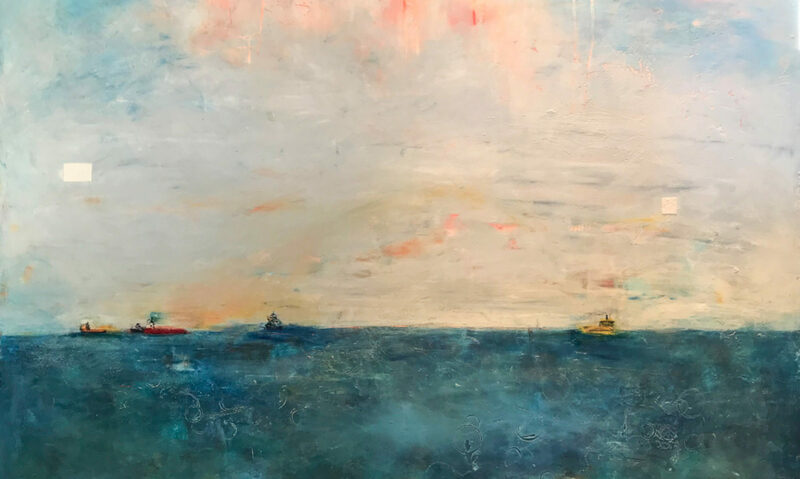 My hands were scrambling to catch the lines on the sailboat I have planted in my lawn so I could untie knots that hold flags hoisted high above the boat and house. I was in tears because I was frustrated at being too short to reach the knots, and the wind whipping around wasn’t helping . I was in tears because this is the sort of thing best done with a partner and helper. It was tender work. I was mad at myself because I had been meaning to take down these flags myself, or call my handyman months ago. And, I was cursing my dad. He tied the knots a year ago last September. He taught me how to tie, and untie, proper knots as a kid on our sailboat. This knot wasn’t one I recognized, and the long tails on the lines, combined with having to reach over my head with the sun and wind in my eyes, made deciding which way to pull on the lines a series of crucial decisions. I just wanted to get it over with and get back in the house before someone saw me. My uncle built the wooden boat by hand over a 20 year period, then discovered he hated sailing. I bought it from my aunt and proudly put it in front of my house, because it is a piece of art. I had a big party to “launch” Quiet Tune. It was one of the best days of my life to see my dad hoist the US, Canadian, California and Ohio flags with my small grandson at his elbow, assisting in putting flags up over his new fort. Friday, I had come home from work to find a letter in my mailbox, hand-addressed, stamped and mailed to “Occupant.” You know that is a situation that is not good from the get-go. Inside, full-color photos of my sailboat and the flags, and citations to the Title 4, the United States Flag Code. The writer was 100% correct – I agreed with them in every way when it came to the flag. I took exception to their rude comment calling the sailboat a piece of junk. Ask my kids – I still put my hand over my heart at ball games and sing – and cry – during the National Anthem. I say the pledge in full at public meetings. I believe in the sanctity of our flag and all it stands for, and I got lazy. I got out there as soon as the sun came up the next morning. The US flag was tattered, and so was the Canadian flag I fly for the heritage of Quiet Tune. The California state flag was pretty much gone, so that came down too. 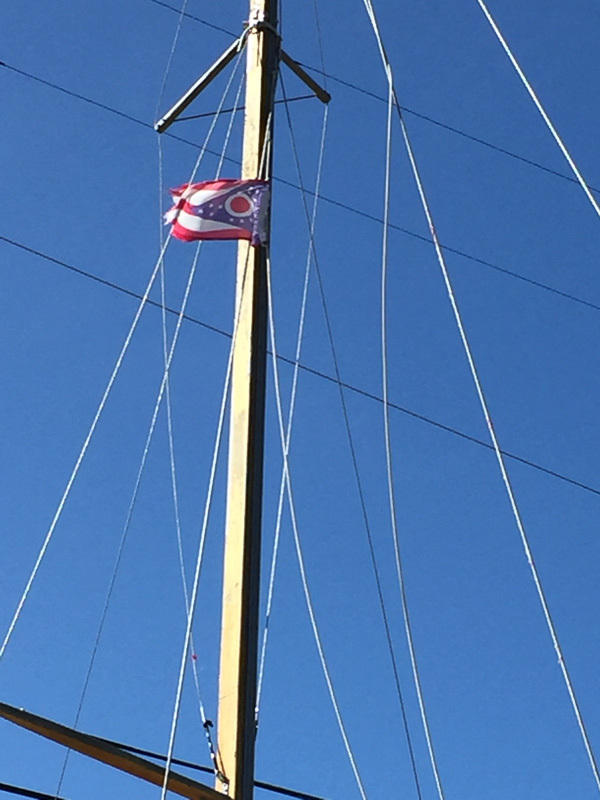 But bless her heart, the Ohio flag – for where I was born – was still in pretty good shape, so back up she went. Later that day, I was talking to a friend about another chore on my list – hanging some art up in my patio. I meant to get it done while my daughter was home on Spring Break, but it just didn’t happen. Again, it is something I could call a handyman to come and do, but I resist. And the friend offered help, but I didn’t answer. I want the help – I want the quiet collaboration of working on something with another person – learning from them and celebrating a job well done together. But I couldn’t admit it. I couldn’t ask for or agree to help offered. The day ended with a visit to my in-laws’ home in Oakland to celebrate my sister-in-law’s birthday. It was a big party with lots of nieces from the divorced side of the family I haven’t seen in awhile, and my ex and his wife and their daughter. It was actually a very pleasant get together. We got along nicely, almost like old friends. My ex and his sister were telling stories from when they were kids – pranks they pulled in the neighborhood, small car accidents – things you want your kids to know about you. My 92-year-old father-in-law sat quietly listening to us while he ate birthday cake. It was just like old times there in that living room, when my now 30-year-old girls were just babies, and when I had a partner to go home and work on things with. But I don’t now. I’m alone, but not lonely, and I guess I have become a bit of a loner.